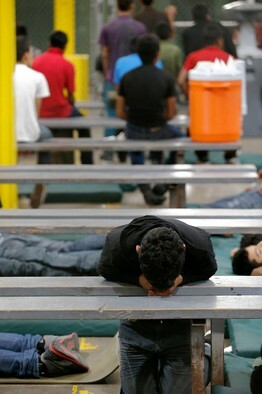 A boy in a holding cell at the U.S. Customs and Border Protection Nogales Placement Center in Nogales, Ariz., June 18. It’s like you live in a house that’s falling apart. The roof needs to be patched and there are squirrels in the attic, a hornet’s nest in the eaves. The basement’s wet. The walkway to the front door is cracked with grass growing through it. The old boiler is making funny sounds. On top of that it’s always on your mind that you could lose your job tomorrow and must live within strict confines so you can meet the mortgage and pay the electric bill. You can’t keep the place up and you’re equal parts anxious, ashamed and angry. And then one morning you look outside and see . . . all these people standing on your property, looking at you, making some mute demand. Little children looking lost—no one’s taking care of them. Older ones settling in the garage, or working a window to the cellar. You call the cops. At first they don’t come. Then they come and shout through a bull horn and take some of the kids and put them in a shelter a few blocks away. But more kids keep coming! You call your alderman and he says there’s nothing he can do. Then he says wait, we’re going to pass a bill and get more money to handle the crisis. You ask, “Does that mean the kids will go home?” He says no, but it may make things feel more orderly. You call the local TV station and they come do a report on your stoop and then they’re gone, because really, what can they do, and after a few days it’s getting to be an old story. No one’s in charge! No one is taking responsibility. No one who wants to help has authority, and no one with authority is helping. America is the house that is both falling apart and under new stress. Those living within it, those most upset by what they’re seeing, know America has big problems—unemployment, low workforce participation, a rickety physical infrastructure, an unsound culture, poor public education. And of course discord of all sorts—a lot of mad squirrels running around the attic. They know America can’t pay its bills. They fear we’re living on the fumes of greatness. They want us to be strong again. Watching our border collapse doesn’t look like a harbinger of progress. Here it must be said that those who live comfortable lives can afford to roll with the historical punches. But people who are not affluent live closer to the ground, and closer to the country’s deterioration. The rougher America becomes, the more they feel the abrasion. They’re not protected. And they know no one wants to be in charge, wants to seize this thing and take responsibility. The mind-boggling fact is that everyone in charge more or less suggests they’re powerless to do anything. And the children keep coming. The president of course has rushed to the scene—to go, as always, to fundraisers. This is at the moment a scandal, but why? Clever people say it’s an unforced error. He has to show he cares! He ought to journey to an overwhelmed border area, stand there and point to the middle distance as a local official in a hopefully picturesque hat briefs him. It’s almost touching how much the press wants to see this. But why? Why do they want to see the president enact a degree of alarm he clearly does not feel? For a quarter-century I have been puzzled by the press’s emphasis on “optics,” their stupid word—actually it is a consultants’ word they’ve lamely adopted—for how things look as opposed to how they are. Their criticism comes down to a complaint they’re not being manipulated well enough. It is a strange complaint. Give the president points for honesty. He doesn’t want to enact an “I care and am aware” photo-op. He will pay a political price, but it is clearly a price he is willing to pay. He never has to face a voter again. The latest border surge has been going on for at least two years. Children and others are coming because they believe that under the president’s leadership, if they get here they’ll get a pass to stay. (They’re probably right.) This was predictable. Two years ago Texas Gov. Rick Perry wrote the president that the number of unaccompanied children was spiking sharply. He warned that unless the government moves, other minors would attempt the journey and find themselves in “extremely dangerous situations.” The generally agreed-upon number of those who’ve come so far this year is 50,000. Now government estimates are rising to at least 90,000 by year’s end.